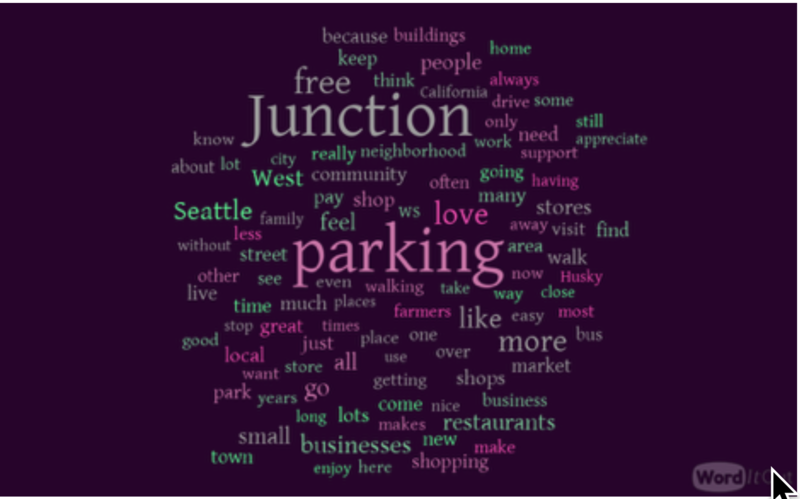 A "word cloud" shows what people mentioned in a survey conducted by the West Seattle Junction Association recently. The survey was administered through a partnership with the West Seattle Blog, Westside Seattle (Herald), the Junction newsletters, and multiple social media channels. “I shop for groceries, hardware, gifts, housewares, art supplies, eat out, get coffee, treats, drop mail, use legal, financial and medical services in the junction - and greater WS area. It's routine. I usually can find parking in lots or street, although I find myself timing trips sometimes for "non peak" times, if I can. I like the junction, I make an effort to "shop local" (haven't been to a "mall' in years). But, truthfully, the free parking is important and part of the character of the business district. It's a hassle to feed parking lot pay stations, but if the lots do go to pay stations, maybe a local residence of greater West Seattle could be eligible to by a "Monthly Junction Parking Permit" - for the lots. Monthly use. For a fixed fee. Still keep the lots limited time, whatever it is now. Except maybe longer in evenings. (I actually don't know the limits because it's ever been an issue for me). The Monthly permits could be like a Park Pass, a ferry pass, a bus pass. Just an idea.